Recently I made this visualization for contributors to https://l10n.org.al for the last two years (2012-2013). This visualization was done with gource. It was a bit of hacking, so I would like to describe here how I did it. For each translation or vote on https://l10n.org.al/ the time and the name of the author is saved as well. So, we would like to get this information from the database, as well as the project to which this translation belonged, for all votes and translations. 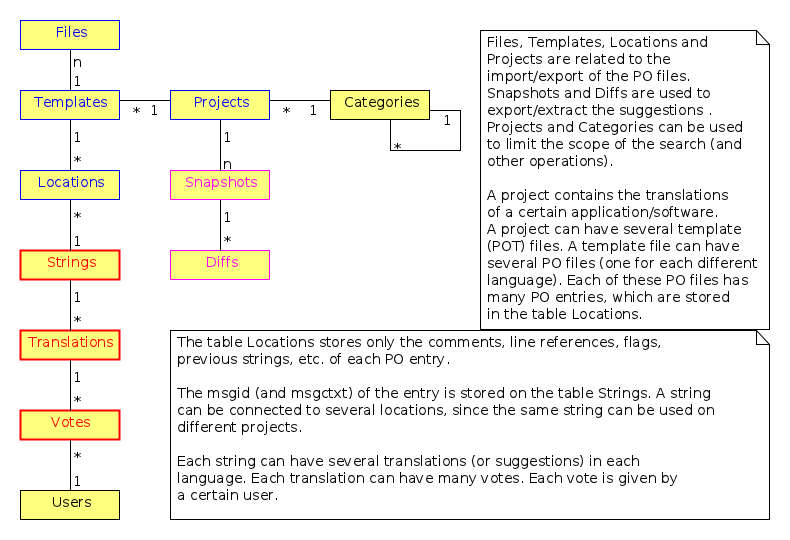 First have a look at this diagram: db_diagram.png just to get an idea of the structure of the database. Then look at the script below which I used to extract the data. This is simply a join of the tables and extracting the fields that are needed. When the time of vote is the same as the time of translation, then this is a new translation and the field new is true. In the result file contrib.txt fields are separated by TAB, so first I replaced tabs with commas (,) for easy processing. I did it with find/replace on Emacs, but any other editor can do this. Gource expects the input file (which is called log file) in the format timestamp|username|action|filename. Gource was designed to work with version control systems (like git, subversion, etc.) in order to visualize the project activity, so the action is expected to be A, or M, or D etc. (respectively for adding, modifying, deleting a file) and filename is the file that was touched. How did I know that these are the right options? I didn't know (especially for ffmpeg), I simply googled and found some examples, then I played with some options of gource in order to get it right.